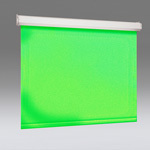 VCB Luma 2 :: Draper, Inc.
A heavy-duty, spring-roller background, the wall- or ceiling-mounted VCB Luma 2 presents an attractive yet practical choice wherever a large manual background is needed for a professional presentation. The VCB Luma 2 is simple in design, yet engineered with heavy gauge components to provide years of dependable operation. This free-hanging surface maintains flatness thanks to the weight of the screen and bottom dowel to improve your videoconferencing image quality. Case dimensions are 5-7/8” high x 5-1/4” deep (15 cm x 13 cm). Background sizes to 12’ high x 12’ wide (366 cm x 366 cm), depending on case style. Background options available: chroma key, or custom printed graphics. 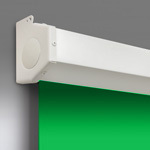 Heavy-duty wall- or ceiling-mounted spring-roller operated background. Optional floating screen brackets or wall- or ceiling-mount for added flexibility. Steel case with matching endcaps available in a scratch resistant white finish or optional black. Optional AutoReturn spring-roller with built-in inertia reduction mechanism ensures viewing surface retracts slowly, smoothly, and quietly into case. Provides intermediate stop positions. Optional 4' or 6' (122 cm or 183 cm) aluminum operating pole. Diagonal size: 108" x 70"
Image/Viewable area: 108" x 70"
Overall size: 108" x 70"
This product is available in many configurations, please contact Draper for pricing.